The Ministry of International Trade and Industry (MITI) is set to provide details of an upcoming review of the 2014 National Automotive Policy, along with information on a number of companies who have established facilities for energy efficient vehicles (EEV) in Malaysia, come January next year, The Star reports. “Next mid-January, I am going to have a stock take on the NAP. 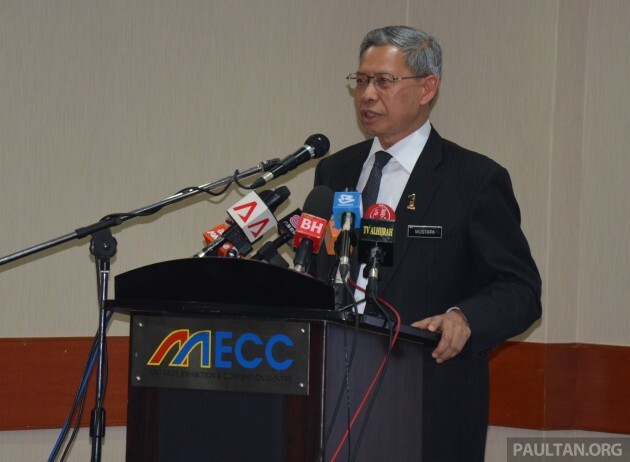 The NAP is one year old and there has been some progress and we will share more details of what has been happening in the next briefing,” the English-language daily quoted MITI minister Datuk Seri Mustapa Mohamed as saying. He was signing five memoranda of understanding (MoU) with corporations for the vendor development programme. Mustapa also voiced his concerns regarding the drop in performance where the export of locally-made vehicles is concerned. Talking to The Star, he commented that the local auto and parts manufacturers “have not done well at all” compared to firms that have pursued business cases abroad. Citing export numbers as an indicator for the industry’s performance, Mustapa noted that Malaysian auto makers and its affiliates face stiff competition from more established international players, along with China. “One day we have to face competition coming from China. China will be an important player in the next few years,” he added. Carmakers that have either established EEV facilities in Malaysia, have been given an EEV manufacturing licence or produce vehicles that have been granted EEV status so far include Perodua (for the Axia), Great Wall (for the M4 and H6) and Mazda (for SkyActiv cars). The W222 Mercedes-Benz S 400 L Hybrid‘s case is unrelated to the EEV programme. Being a locally-assembled (CKD) hybrid, that gets full duty exemptions. NAP 2014 stipulates that as long as a hybrid is produced in Malaysia (like the Honda Jazz Hybrid and Nissan Serena S-Hybrid), it is eligible for full import and excise duty exemption until the end of 2015 – regardless of the size of its internal combustion engine (or its fuel efficiency!). Under NAP 2014’s EEV programme, “customised incentives” – including lower taxes, grants and others – are given to carmakers who are interested to participate. 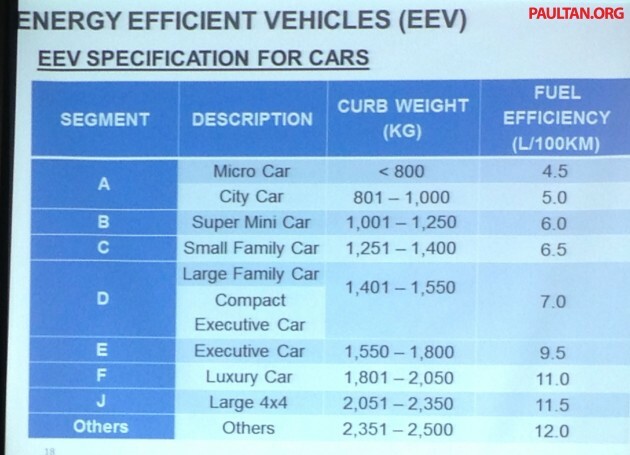 In its simplest form, the EEV is defined as a vehicle that meets a set fuel consumption figure for its kerb weight, regardless of its method of propulsion or engine displacement (see table here). If a carmaker builds its EEV(s) locally and wishes to take advantage of the incentives, it has to apply for EEV certification from the government, much like Thailand’s Eco Car programme. However, unlike our northern neighbours’ scheme, we have no minimum investment or minimum annual production pre-requisites – but we also don’t know exactly how much carmakers get here in terms of incentives. Perhaps MITI will reveal more in January. Plizzzzzzz, don’t provide us with anymore details. There’ll be nothing new except confusion, anger, resentment and more stupidity. Just leave us alone. MITI is a sour damn loser. Care for EV so much, Why still taxes 100% of CBU cars. Do the minister do not feel a shame… just abolish MITI whole Rakyat will be happy !!! Last time MITI say our car prices high because we get subsidised petrol. Now petrol got no subsidy, where is our cheap car prices? Typical Sendiri Cakap Sendiri Syok. Who is interested on the NAP’s EEV? No one! Others did, we silly follow but w/o serve the main purpose. BUT WHAT WE SAW THE GOVT DRIVEN POLICY TO CONTINUE ALLOW EURO 2 DIESEL POLLUTING ENVIRONMENT. I STRONGLY SUGGEST THE RELATED MINISTRY SPEND 5 MINS EVERYDAY BEHIND THE BUSSES & LORRY EKZOS TO ENJOY THE OCTOPUS FUMES. Origin idea of whatsoever EEV, EV, HYBRID, etc… to surve the purpose achieving GREEN to environment. No need to talk about EEV and all that. First and foremost, where is Najib’s promise to reduce car prices by 30%? More than a year ago, Najib promised every single of the 30 million Malaysians that he would reduce car prices by 30% if we voted for him and his BN party before the elections. Najib swore that BN always kept their promises and we Malaysians had nothing to worry about BN not keeping their word. He told us not to trust Pakatan and he firmly said he would match Pakatan’s manifesto of reducing car prices by 30%. Nearly ALL BN Ministers kept on saying that we could trust BN and we should not trust Pakatan. More than a year has passed, nothing has reduced. Infact, car prices have gone up! All the car companies in Malaysia are eventually owned by the Government. UMW for Toyota, Honda by DRB, BMW, Hyundai and Ford by Sime Darby. Virtually every single company is owned by the Government (GLC). So, if they want to reduce car prices, they can. But they don’t want to. They blame the car brands but we Malaysians know that nearly ALL car brands are owned by the Government. It is up to the Government to just give the order to reduce prices. How can we trust Najib, BN and UMNO if basic promises like this to reduce car prices they cannot keep? This is just a basic and simple promise. What about bigger promises of tackling corruption, improving healthcare and education? Has Najib lied to us? It looks now, they are trying to manipulate what they said and say just for imported cars. Why make C and D segment cars only affordable to the well to do and wealthy? All cars must be made affordable to all Malaysians. We Malaysians earn so little compared to other countries and yet, the Government whacks us with super high car prices. 78.6% of all EPF contributors still earn RM3000 and below. (That is from RM500 to RM2999). This was announced by Raja Nazrin recently quoting EPF data. He was proving the Government wrong as the Government again lied to the people that we are on our way to earn GDP Per Capita of US$48,000 per annum by 2020. That is US$4000 (RM13,000) per month by 2020, which is 6 years time. Raja Nazrin, Sultan of Perak refuted the governments claim and openly declared EPF figures that 78.6% of all EPF contributors still earn RM3000 and below. He also said 2 million households earn RM5000 and below which Raja Nazrin said was Government statistics. So, how can people afford cars costing more than RM70,000? Why is it just exclusive to high income earners? Do you think average gaji of Malaysians will go up to RM13,000 in 6 years time? Mustapa, please ask your boss to honour his promise. That is more important than all this EEV. Most car makers rather go to Thailand open new factory than being confused by MITI, AP kroni, Proton. I find it strange that BMW hasn’t been granted EEV status for their locally assembled diesel powered cars – looking at that table they all come in well under the fuel consumption figure for their given category – yet Mercedes managed it with the S Class Hybrid. Mercedes I think they started work on getting it way early. Most of the S Class Hybrid would have fallen into the hands of some minister or anyone closely related to the government. Do you really think the government would reduce it’s revenue when they are being squeezed? Plus the quota for the S Class is so ridiculously small. I also find it strange that they consider “luxury” synonymous with large capacity engines. times have changed a lot. You can find 1.6L BMWs and Mercedes cars now. Matthew, you may want to actually read the article before commenting. According to it S Class Hybrid did not receive EEV status. That is just enjoying exemption as CKD hybrid till end 2015. Such exemption is not exclusive to MBenz. BMW Diesel cars are not hybrids. Neither qualify for EEV status. The Ford Ranger T-6 2.2 auto that I am driving is just below 2000kg, it has 9.9~10.4L/100km so it is EEV! No need to reveal anything sir. I am truly contented with our Proton’s and Perodua’s that is already world class standard. There are actually a lot of EEV cars in our market. Pretty much any German car is an EEV, a fair number of newer Japanese cars are also EEVs too. However the issue is this customised incentive. Why customised. Why not make it standard. And we all know how it works. If you don’t sing and dance to MITI’s whims and fancies, forget about it. That is the main reason why all the automaker investments are going to Thailand and Indonesia. There their policies are transparent unlike our NAP which only deals behind closed doors. With the political unrest in Thailand its amazing that they can still get car manufacturers to continue investing there. True. How much customization involved in ‘Customized incentives’? How are they sure that everyone receives the same benefits instead of a lopsided one? The term “customize” sounds like “I scratch your back, then you scratch mine”. Very fishy indeed. Someone ought to make huge bucks here. Just like other decisions, 1st world country vision but 3rd world country implementation. Why? They even fail at giving incentives at fuel efficient diesel cars. I will not be buying any new car until i see a real affordability – ie average joe can buy with only 3-5 year loans. I will maintain my fully paid cars, which are second hand and if i need a car, I will be a second hand car. talk, and talk, and talk and talk. In the next election, i am voting for our proboscis monkey. They sit up high in the tree like our politician, but at least they leave us alone and when they open their mouth it is a call to mate unlike our politicians who spews rubbish when they do the same. W205 C Class Mercedes Benz fuel efficiency is 5.3l/100km and its kerb weight is less than 1400kg, thus the 2015 CKD unit should qualify for EEV incentives. I was crossing my fingers when I booked a CKD unit. Come next year, if the announcement doesn’t affect the price reduction, (couple with the lower 6%GST replacing 10% sales tax), we can all just assume that the government is really tokingkok. And as the booking fee is 100% refundable, my action then would be greatly influenced with the NAP EEV promises. transparency is a must for announcing the detail of the EEV programme, incentive given to car maker shall be make clear. a set of fuel consumption test standard must be defined to make sure EEV qualifiers are for real, not like the ones on Axia. i bet in real life axia fuel efficiency was like somewhere between 15km/l or so?